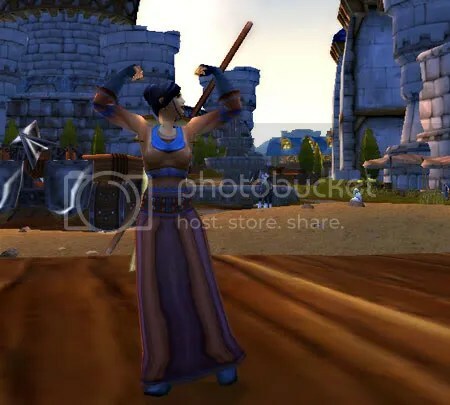 Ironsally had planned on posing for you in her new embroidered armor when she hit 45 but after the time she had getting there all she wanted to do was sit down in beautiful downtown Gadgetzan and eat a horse … or a whole pig dammit. At level 43 she was questing in Thousand Needles. She was given a choice to Free Freewind Post or go to Tanaris so wanting a change of scenery she chose Tanaris. Oops, that may have been a little premature. The mobs were one to two levels above her and strangely not any harder to kill but oh the misses sure hurt. She frequently had three misses in a row on a level 45 which made her so low on mana that if she got an add she was in big trouble. Being a cocky Warlock she decided to stay and see how it went. She died three times trying to take down Captain Dreadbeard but other than that hasn’t had much trouble. All she could think about was the new armor available at 45, her last set of store-bought whites. She also upgraded her wand from the Pitchwood Wand to the Blackbone Wand for a tiny dps increase but since the next possible wand upgrade isn’t until level 70 she wanted all the power she could get. There are no gray wands so the level 70 will be her last upgrade. Her clothing situation is my big concern. If you look up gray cloth drops there are plenty of options all the way to level 82 but they have to drop for you. She hasn’t been very lucky with cloth drops and people don’t sell them very often, especially at the higher levels. In hindsight I see it that it would have been helpful to start her on Fenris. Every time I get a gray cloth drop with a character I go, Yes! … oh no wrong server. Ironsally actually uses bandages. All my characters trained first aid but none of them ever really used bandages with the exception of the Rogue. Ironsally really loves bandages. When jumped by more than one mob and she’s low on health from Health Funneling her Voidwalker she can regain her health with a bandage while he fights the bad guys. It’s interesting that playing this way is so different than playing a regular Warlock. It’s certainly simplified, only a few spells are practical to use and it’s a dangerous land, she has to pay attention to her surroundings. None of those spoiled heirloom-wearing, talent-pointed, characters on Fenris do, pssht. I had been checking the AH for gray clothing around her level but I think I will start looking at all levels and buy something if I see it. I just bought her a level 77 Frost-Rimed Cloth Hat how’s that for optimism! 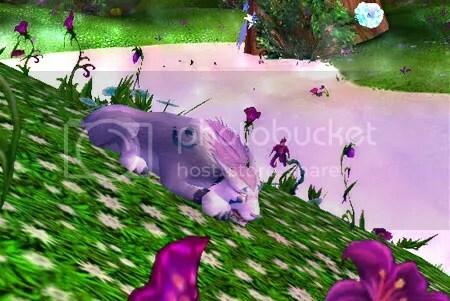 I heard about the Fox Kit pet that drops from Baradin Foxes in Tol Barad Peninsula fairly recently. I didn’t know how rare they were but I thought, hey, I’m there anyway I might as well try for another pet as I’m at 105 of 125 for the achievement Menagerie. Upon seeing the foxes I was a little reluctant to kill them. They’re, well, cute. I thought well, at least I can skin them so I managed to justify the wanton killing of cute furry foxes to myself. Pretty easily I’m sad to say. My precious! Oh my precious little fox kit, come to me. Yes, the madness of pet collecting overtook me and turned me into an evil fox-killing Gollum of a cat. For the last, I’d say month or so every time I do the dailies I kill all the foxes I see. I don’t go out of the way to get every spawn I just kill the ones I see and make a bit off of selling the leather. It pretty much got to the point that I had forgotten why I was killing them. 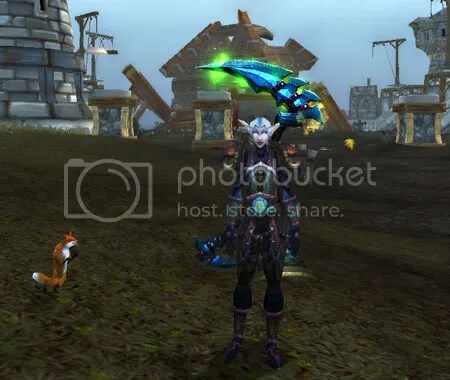 Yesterday I was down to only 4 more dailies left and thought about skipping Tol Barad but decided to go before I logged and right where she’s standing in front of Wellson Shipyard the fox kit dropped. So, if you’re after it, don’t give up. 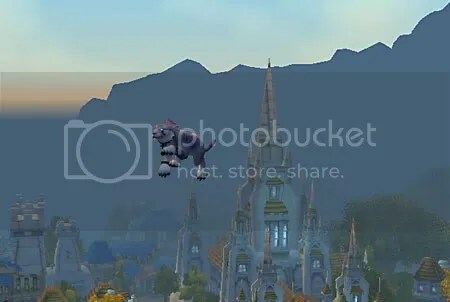 Just get in that crazed pet collector mode where you go on killing sprees with no memory of why you’re doing what you’re doing and sooner or later it will drop. And Elune be praised, I can now stop killing those foxes. I’ve been wondering about this for quite some time. It’s a phenomenon I started noticing a few years ago. Players treat my cat form Druid differently than my other characters. I couldn’t think of a more appropriate title, I really don’t think other players perceive the cat as lacking in strength but they sure do have a tendency to try to protect it. It doesn’t have anything to do with gender, all my characters with one recent exception are female. My Warlock, Shaman, Death Knight, and Hunter never have players jumping into the fray to defend them although some of them could use the help. Yesterday while doing the Firelands dailies I was once again rescued from those evil spiders by a Death Knight. Kitty was in no danger whatsoever and said Death Knight almost bought a ticket to a brief stay in Azerothian heaven because of it. And I know, I know, Death Knights are evil and he was probably trying to steal a kill, nope they were all gray to him as I’d tagged them all on purpose to try to speed up the spider killing. Anyway, a shout out to The Templar Knights. You have a very nice animal loving Death Knight on your roster. I don’t know, look at her, does she look defenseless or helpless, or is it just because she’s a cat. When my druid was young, leveling through Hillsbrand she made a friend. When I logged in and he was on, he’d usually come to protect her while she quested or ask if she needed help. She really didn’t but this Fury Warrior seemed to like to protect that cat. Maybe being protective comes with the territory when you’re a Warrior. I’ve done some googling to try to find information about this but I’m doing it wrong because I can’t find anything relating to this cat phenomenon. 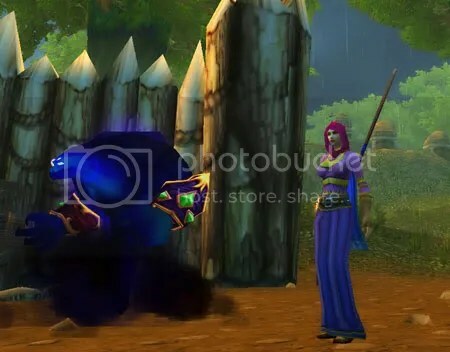 Any other Druids out there noticed this? Maybe my Shaman should start running around in dangerous areas in Ghost Wolf form to test this, I wonder if WoW players are as protective of canines as they are of cats. Whatever the reason, a collective thank you to all those who have stepped up to defend the cat! Sheesh, Warlocks, she’s such a showoff. And I don’t think it’s all that nice to be showing off considering Ironmary’s, um, situation, well, we won’t go there. We’ll just leave poor Ironmary alone. Ironsally hit 40 in Dustwallow Marsh. She chose this rather than helping out in Andorhal because she thinks all those Diseased Black Bears, Carrion Vultures and Devouring Oozes are just icky. 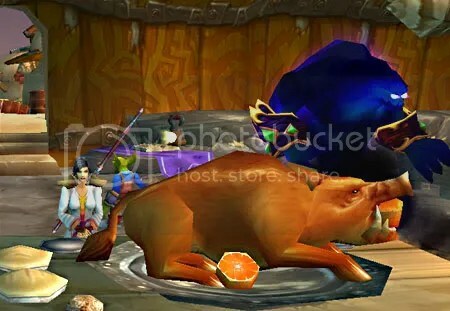 When doing the quest Hungry as an Ogre! for Jarl she thought she might have to reconsider basing her choice of zone on ickyness since once again those horrible Murlocs almost did her in by ganging up on her. She barely escaped. 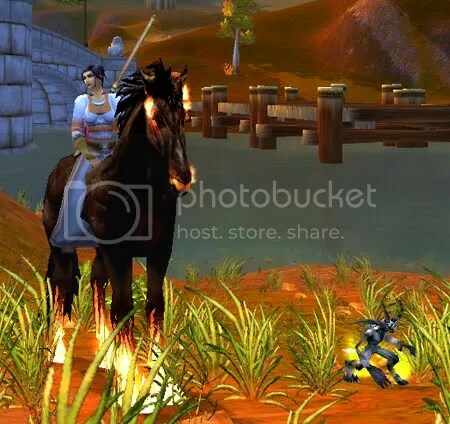 Was she in a hurry to get to level 40 to get her Dreadsteed, nope, she was after her brand new Pitchwood Wand. Playing a regular Warlock I honestly don’t remember ever using my wand. I just carried it around for the stats but never found a need to use it. Boy, is that different with Ironsally. Mana, playing a regular Warlock has never been much of an issue because of Life Tap but Ironsally is usually in dire straits when she runs out of mana and can’t regain it with Life Tap because she’s usually about tapped out of life at that point from being beaten to death. So now that she has to learn mana conservation a wand is essential. She also learned the hard way that many of her spells aren’t practical. I love casting Rain of Fire just because. Well Ironsally learned that there will be no more raining of fire, she did it once and was out of mana but was saved by her trusty wand. Two mobs is a non-issue with Ironsally, three is doable, at four I usually run for it. With Ironmary one mob could very likely kill her, more than one impossible for me anyway. It sure makes a difference having a bodyguard! We are definitely killing them slowly, it seems to take forever for these mobs to go down but down they eventually go. Ironsally doesn’t have the problem with mobs her level like Ironmary did but she does have to be patient while waiting for those little suckers to finally die. From playing her so far I’m getting the impression she’ll be able to go to level 60 without too much trouble but beyond that it might get a lot harder. When checking Wowhead it looks like my last set of white vendor armor will be at 45 and after that she’ll have to rely on getting gray drops and she sure hasn’t been lucky so far on getting cloth drops, everything seems to be leather. I’m going to remain optimistic though, maybe she’s saving all her drop luck up for all those higher levels. She’s still a lot of fun but my Druid sure loaths Ironsally who’s keeping her from her Fireland dailies. Ironsally my Warlock entrant in the The WoW Ironman Challenge has reached level 30. No problems, no worries so far. They’ve had some really close calls when they got jumped by three trolls, um, well, what happened was a fear gone wrong, my bad. Ironmary my original Mage entrant is sitting in Tarren Mill at level 27 refusing to come out. I don’t know what she’s doing, contemplating the meaning of life? If you try to talk to her she just mumbles something that sounds like, “Oh, the horror, the horror, nooooo …”. Personally I think she’s sitting there faking, racking up rested bonus but we’ll see if she ever comes out of it. Ironsally’s problems have been wardrobe related. With all the gray and white drops she’s had, not one single pair of shoulders have dropped for her. To celebrate level 30 she went into the big city and found Interlaced Cowl on the AH. They wanted 16 Gold!! Did they seriously think someone would pay that! What, well, yes I did pay that but still. But really, isn’t it lovely and warlockish. This morning I did a quick check of the AH and finally got a pair of shoulders for a reasonable 63 silver so now Ironsally has her wardrobe sorted out. Ironsally is still in Northern Stranglethorn and still has quests left. I want to move on but common sense tells me to complete the green quests while you have them and don’t be an over-confident Warlock. One thing that has started to bother her a little, besides having to vendor blue quest rewards, is that pulsing talent button on the bottom of the screen. I’m thinking of putting a sticky note over it. Anybody else hear it? Okay, maybe I do know why Ironmary is sitting in Tarren Mill mumbling. She’s trying to resist the voice of talents, muhahaha. Update: I’m excited! We have another challenger! IMRAITH!’s Sallyogreydy is in the running with a Priest! I think Psynister and Vrykerion may have created a monster (me) with the Ironman Challenge. I have now started an experiment within an experiment, her name is Ironsally. She resides on Zangarmarsh along with her Forsaken cousin. Playing Ironmary is exactly like having a hangnail and constantly picking at it. It really hurts but you can’t stop doing it. At some point I started wondering, a lot, is this challenge that hard or am I just completely incapable of playing a Mage, really, I want to know. Ironyca’s Elford is doing just fine. No embarrassingly high total of deaths like Ironmary. So I had to know and Ironsally was born. I planned to roll a Goblin Warlock and then I must have been distracted by phone or something. I was level 10 or so when I realized I’d made a human. Oh well, she’ll have the challenge of having no money cause the rich Irons are Horde on Zangermarsh. No fancy Tuxedo Pants for Ironsally. And I had wanted to do the same quests at around the same level to see if the Warlock had the same problems the Mage did to be fair to, well, me. I think it’s now pretty evident I’m an incompetent Mage. The ease that Ironsally has been leveling seems to prove it, it’s not the challenge it’s me. Wait, let me check … okay Ironsally has had six deaths and none of them had anything to do with the constraints of the challenge. First was me not paying attention and running off a cliff to fall to my death. The second occurred when Ironsally was jumped by a few mobs and I stood there trying to decide if I should use a Healthstone or not instead of running. It would have been better to ponder my moral dilemma about Healthstones BEFORE combat but hey, what are you going to do. The next four deaths were on this quest chain and Ironsally had to die four hideous deaths by Elites because her stupid operator didn’t take the time to READ up on how to operate the Bravo Company Field Kit, sheesh. And I’ve since decided (while not in combat) not to use Healthstones or Soulstones. I’m not giving up on Ironmary, I’m going to continue to level them both but at the rate Ironmary is progressing I started to worry that Blizzard may move on to other things before I even come close to approaching level cap. Ironsally has had no problems yet related to her lack of gear, stats, or talent points. One thing I did notice is that while playing normally and questing, I’m interested in what the gear rewards are for a quest. Now all I care about is XP, don’t need no stinking gear, just give me XP, and oh, money’s okay. I really have to say it’s been a long time since leveling was this much fun.